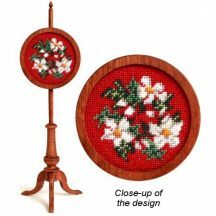 Would you like to make one of these beautiful pole screens, to enhance the fireplace in your twelfth scale doll’s house? These are easy to make, and great fun to do. In ‘real’ houses, pole screens were used to shield the face of the person sitting near to the fire from the heat. 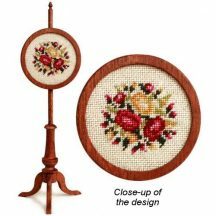 The round frame piece that holds the stitching can be moved up and down the pole, to position it in exactly the right place to keep the complexion of your doll’s house doll suitably pale! 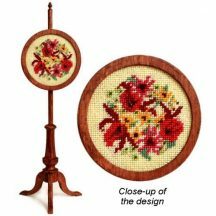 The pole screen measures four and three quarters of an inch high, and is made from finely-turned, high quality mahogany. 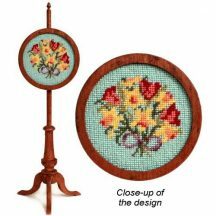 The design is to be stitched in tent stitch (similar to half cross stitch) on silk gauze, using one strand of Anchor stranded cotton. Some designs are to be stitched on 40 count silk gauze, and some on 32 count silk gauze. See the description of each kit for details. 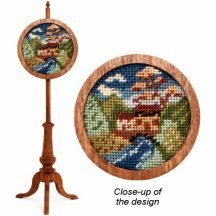 The kits contain an easy-to-assemble twelfth scale mahogany pole screen kit, along with all you need to stitch the design – a generous piece of silk gauze fabric, ample Anchor stranded cotton thread, a fine needle, colour block chart (the design is not printed on the fabric) and detailed instructions. 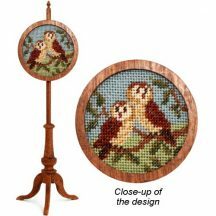 See what you get in a pole screen kit.